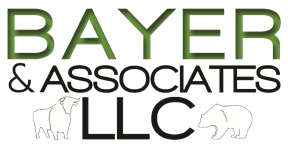 Bayer & Associates, we understand that as a successful individual or business, you work hard and have specific financial requirements and needs. When it comes to managing your assets and meeting your financial goals, you’d want to partner with an experienced and sound professional with a practical, no-nonsense approach who allows you to maintain control. We make it our priority to understand you and your business and the financial goals you want to achieve. We make it our business to ensure that you have complete solutions - customized to fit your needs - to maintain and leverage your current success. Sound financial decision-making and implementing strategies have become more complex because of the extensive amount of financial information available. We make it our responsibility to get rid of the complexities and provide you with an effective strategy. We partner with you: you tell us your goals; we’ll provide the solutions; you control the direction. We invite you to explore our Web site and become acquainted with us.